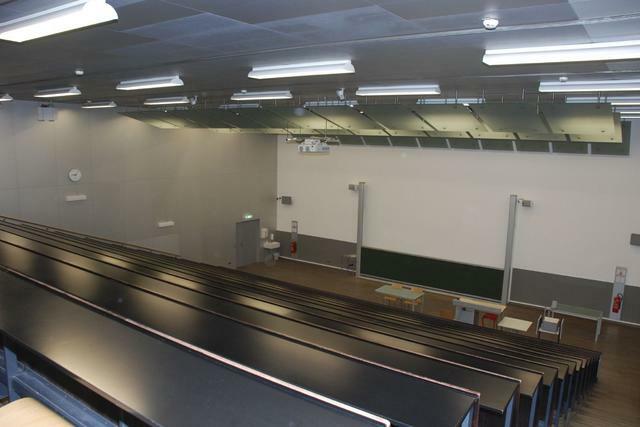 Recently all lecture halls at TU Graz have been evaluated from a room acoustic viewpoint. Unfortunately, speech intelligibility in many halls is very poor. While for some halls room acoustic redesign can improve the situation, for others an additional electro-acoustic amplification is necessary. Yet, many lecturers are not comfortable with the lapel microphone that is provided in larger lecture halls and therefore speak without any amplification. The main problem is the increased vocal effort of the speakers which can cause long-term damages to the vocal chords. A far-field microphone electro-acoustic solution would improve the acceptance by the lecturers and increase speech intelligibility in the lecture halls. This is an important step towards barrier free communication at the university. To achieve a solution for this problem several challenges have to be solved. The speaker has to be located and tracked and a clean, high-quality signal has to be reproduced. We need feedback cancellation to avoid howling and finally a real-time implementation is necessary. For this implementation only a very small latency is allowed to avoid an echo effect. In addition we want to evaluate whether room acoustic measures are helping to improve the performance of the system. If we could not only amplify the speaker but also questions from the students the system would be of even more value. An early attempt to solve this problem is reported in . A paper on room acoustics in lecture halls can be found here . Since the project is too large for a single person we either encourage teams or offer to just define a subset of the main problem to be solved for a thesis or student project.